So Swatch has finally decided that the time (ahem) is finally right to give this smartwatch business a proper go. The iconic Swiss watchmaker confirmed it's making its own Swiss OS, so look out Apple etc etc. CEO Nick Hayek has certainly changed his tune after he once called the Apple Watch an "interesting toy". Hayek, along with the rest of the Swiss watchmaking fraternity, are being made to eat their words. While the smartwatch explosion hasn't happened just yet, sales are certainly on the rise whether you're talking the full fat kind or hybrid smartwatches. Some might be thinking it's all too little too late. The first Swatch OS-packing smartwatch is expected to land in 2018. By that time there's likely to be a new Apple Watch, Samsung Gear watch and judging by the rate in which Android Wear watches are flying out the traps, more Google-powered smartwatches to compete with as well. Swatch is already playing catch up and the question is whether it can make up the lost ground or whether it should even be bothering at all. I'm firmly in the camp that it's the right move to give it a go. It's not too late. The company has already reported that profits and sales were down in 2016 with Swiss watchmakers on the whole enduring one of their worst years last year. But Hayek is confident that things will improve in 2017. Next week I'm going to be making a return to Baselworld, the most glamorous of all the shows and definitely not your typical tech show. Seriously, you need to get properly dressed up for this one. Away from the ludicrously expensive watches and a crowd that would look better suited at a glitzy dinner ball, one of my fondest Baselworld memories from a few years ago was walking over to the Swatch booth and taking a nostalgic trip down memory lane. It was a huge collection that spanned decades of loud, colourful designs from Olympic tie-ins to countless limited editions. It felt like everyone had a Swatch when I was younger or at least, it was just one of those watches you always saw out and about. History and tradition will play its part in Swatch's future smartwatch ambitions, but it won't guarantee success. There's a new generation to chase now. A generation that actually want to be connected all the time and smartwatches are helping to make that possible away from smartphones as they become more standalone. 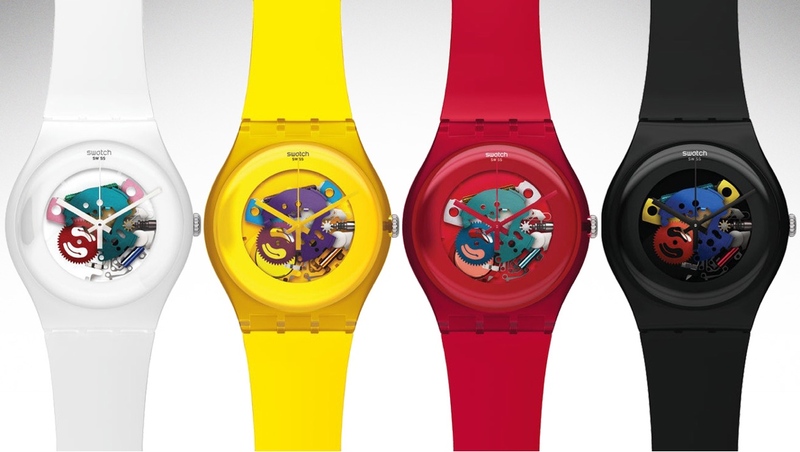 I have no doubt that Swatch has been paying close attention to the smartwatch scene. It's had ample opportunity to see the features that people actually want from a smartwatch such as from-the-wrist payments. Hopefully it'll avoid making the same mistakes that has caused the likes of Apple, Samsung and Google to quickly adapt and evolve their own smartwatch operating systems. Swatch only needs to look at the likes of Fossil and its umbrella of designer watch brands for inspiration with its continued push to launch hundreds of different designs and collections. Granted, the full fat kind rely on Google's Android Wear software, but Fossil is getting these out quick and the Swatch Group has plenty of big watch brands, such as Omega and Longines, to smarten up after it kicks things off with Tissot. It's a shame that Swatch probably won't have anything Swiss OS-related to show off just yet at Baselworld next week, because it definitely has piqued my interest. Hopefully it'll use this time up until the first launch next year to deliver something that helps to solve some of our biggest smartwatch gripes. We're also waiting to see that this watch company is going to treat this interesting toy with a bit more respect and give us all something we'll really want to wear.